One player known for her offense and another known for her defense signed Thursday in the All American Room at SCCC/ATS. 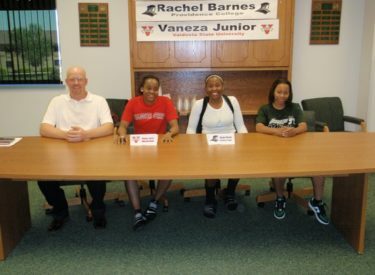 Rachel Barnes signed at Providence and Vaneza Junior at Valdosta State. Barnes averaged 21 points and eight rebounds for the 31-3 Jayhawk West champion Lady Saints. Barnes scored 724 points this season which is second behind Jamie Talbert’s 805 on Seward’s all time single season scoring list. She finished third on Seward’s all time scoring list behind only Tegan Cunningham, Talbert, and Kim Ortega. The 5’8″ sophomore from Windsor, Connecticut signs with a Providence program which went 19-15 this year and 7-9 in the Big East. Vaneza Junior follows fellow Mozambique, Africa native Nadia Rosario to the NCAA Division 2 school in Georgia. Junior averaged 10 points per game. Junior was one of Seward’s top defensive players with 90 steals this year. She joins one of the top division 2 women’s programs in the country where Liberal’s Jenny Head is an assistant coach. Junior, Barnes, and Toby Wynn will be guests on the Sportsguys Friday morning between 7:37 and 9 a.m. on Talkradio 1270 and kscbnews.net.